Thinking about a day School Skate, Dance or Karoke party?? • We also do provide use of the lunch room prior to or after your booking for snacks and allow outside food and drinks. • You may choose between inlines or roller skates and may switch once between skate type. You are more than welcome to bring in your own inline and/or roller skates. Helmets and safety gear are NOT MANDATORY. However it is recommended if you or your guests feel it is required. Skate party first and then have a dance or karoke. With our great pricing you could save on hiring a DJ for your day school dance and have up to 3 fun activities in one booking at Sportsworld. • We will provide you with an interactive DJ with giveaways and our floor features a light show, music videos and thumping sound system that will keep you in the groove. Our request format means that we will play whatever you want to hear. For all your munchies our concession will be open and for all you video bugs our retro video and interactive arcade will keep you amazed. We also have a karaoke machine, pool table, and Air Hockey table. The best part of all. We clean up! • The karaoke system will be available to use FREE of charge. Time is limited depending on the booking slot. • We are conveniently located , which makes our location very convenient from all parts of the city and surrounding communities. 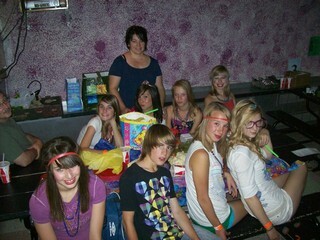 A skate-dance/ karaoke party makes a great year end event or as a special break throughout the school year. Small pop, juice or water, hotdog, & bag of chips. *This must be pre-booked in advance in writing at least 2 days to your booking. Fax in order 472-6377 include a contact name and number for confirmation. You will be billed for all the combos requested including no show guests. *NO EXCEPTIONS OR SUBSTITUTIONS. .